Last night was Taco Thursday in our home. It isn’t a Thursday thing. It just so happens we ate tacos on a Thursday. This took three recipes to bring together. Taco seasoning. Tacos. Corn/red pepper salsa. Three recipes in one this morning! It is your lucky day! Well really it just takes all three to bring this tasty meal together. Full disclosure. 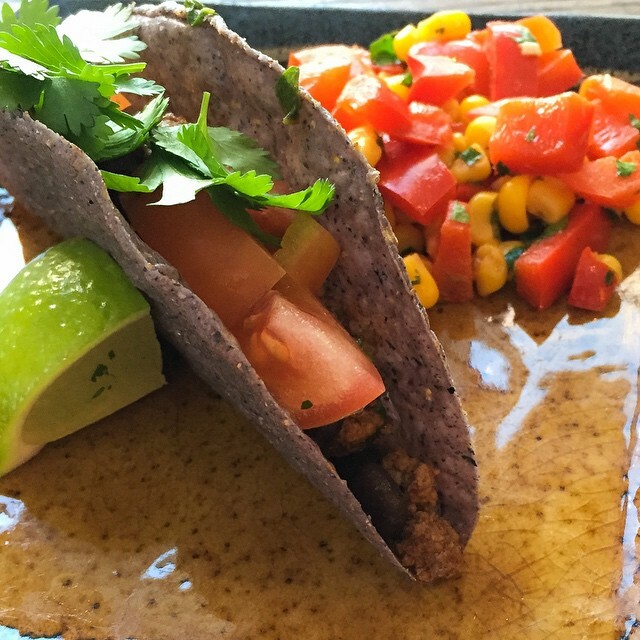 These tacos are extra lean ground sirloin. On a typical taco night in my home we are eating turkey tacos. Unfortunately my butcher was out of white meat ground turkey. They would have had to freshly grind some more for me. While that sounds amazingly fresh, it seemed a bit too time consuming with two small boys in tow at the grocery store. One extra small boy was about 20-30 minutes away from being entirely ready for a nap. I took a hard pass on waiting and got the lean beef instead. Time management people! These tacos pack an extra nutrient punch with black beans and spinach. I always add spinach to any dish I can. You cannot get enough leafy greens. I have no problem consuming my leafy greens, but sometimes my boys do. This is a great and tasty way to get them their greens. I combine all of these in a small storage dish with a lid and I shake until perfectly blended. I keep my seasoning in this dish all of the time. I just add a batch to the remaining batch. I have even labeled the lid “taco seasoning” I use it in more than just tacos. If I want something southwestern in flavor, I often turn to this seasoning. I do not add garlic to the dry seasoning. I love fresh garlic. I will always mince 1-2 cloves of garlic and cook it in a pan with some olive oil before adding any meat/veggies and the taco seasoning. 1lb ground meat. Turkey, chicken, extra lean sirloin. Saute the garlic in the olive oil until soft and fragrant. Add the meat and brown. After it begins to brown add the taco seasoning. Mix well. Cook through a little longer. Add the lime juice and vinegar. Cook for another minute or two. Add the black beans, mix well and heat through. Toss in the chopped spinach. Cook until spinach is wilted and the meat is thoroughly cooked. Scoop into taco shells. Add your desired toppings. I added tomatoes and cilantro to mine. I forgot to dice up my jalapeño. Normally I would add that as well. Cook red pepper in the olive oil until it begins to get tender. Add the frozen corn and continue to cook. Add the lime juice, cumin, and sea salt. Mix well. Cook through until peppers are soft and corn is no longer frozen. Once done add the cilantro and combine well. Add all to your plate and enjoy a deliciously fresh taco night in your home! I am definitely going to try this taco seasoning. I love tacos but since being GF, I have found that almost all the packaged taco seasonings have gluten. Thanks for the recipe!